The free The SaaS CTO Security Checklist is the best way to start increasing the security measures of your business. Security is important but you don’t have to hire on a staff of elite marines and buy the best equipment to stay safe. 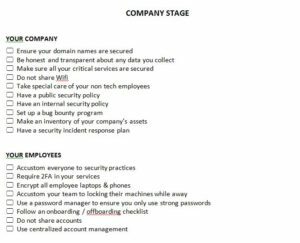 This free checklist templates will show you some of the more simple, yet impactful, ways you can ramp up the security efforts of your business. If you’ve ever had the misfortune of being hacked, you know the pain and agony that come with the aftermath. To avoid all that, simply download the free template and read the guide below for some tips and best practices that go along with better security for your business. To download your free copy of the SaaS CTO Security Checklist, you will scroll to the bottom of this page and follow the link at the bottom. Next, start at the top of the page and read the short description given. The sections of the template below will be broken into different categories. You will start with the company. Some of the examples given pertain to internet behavior. For instance, you will see best practices on domain names, Wifi protection, and much more. Now, the next section is for your employees. To make sure they have everything they need for their own security, go through this list and check off what you accomplish line by line. Similarly, the template also goes through the code for your website, any applications that you may be running, and products by user license. To print the sheet for actual use, you can scroll back to the top of the page and click “File” then “Print.” Everything you need to keep your company website safe is in this document, just print, read, and check off the items on this list and you’ll be good to go!